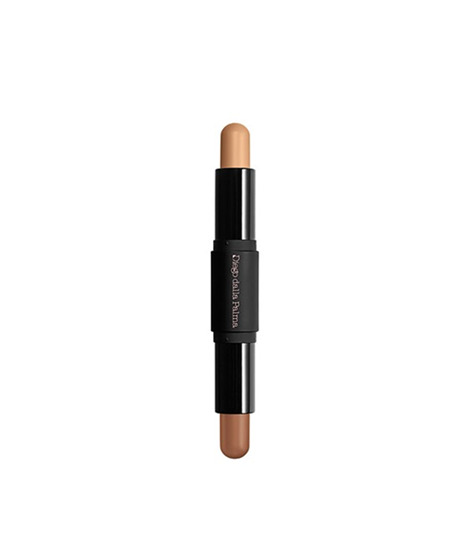 A practical duo in a stick conceived to create 3D make-up, at any time and in a few simple steps, allows easily layering several colours imperceptible finish. Perfectly skin-friendly. It glides easily over the face, instantly melting and leaving the complexion perfectly smooth and velvety for irresistible comfort. In two shades, light to medium and medium to dark, which meet the needs of different complexions to create shadows, sculpt and define every woman’s face perfectly and professionally. It glides easily over the face, instantly melting and leaving the complexion perfectly smooth and velvety for irresistible comfort. INGREDIENTS/COCTAB: NEOPENTYL GLYCOL DICAPRYLATE/DICAPRATE, ISONONYL ISONONANOATE, POLYBUTENE, TRIETHYLHEXANOIN, POLYETHYLENE, SYNTHETIC WAX, GLYCERYL BEHENATE/EICOSADIOATE, HDI/TRIMETHYLOL HEXYLLACTONE CROSSPOLYMER, SILICA, POLYHYDROXYSTEARIC ACID, CAPRYLIC/CAPRIC TRIGLYCERIDE, SPILANTHES ACMELLA EXTRACT (SPILANTHES ACMELLA FLOWER EXTRACT). MAY CONTAIN (+/-): CI 77891 (TITANIUM DIOXIDE), CI 77491 (IRON OXIDES), CI 77492 (IRON OXIDES), CI 77499 (IRON OXIDES).